Consumers need to engage with a brand’s marketing message at least seven times before they commit to purchasing a product, as the age-old marketing maxim goes. A university education isn’t a commodity, but similar ‘buying behaviours’ can be seen in students who are looking for the best place in which to invest in their future. Recent research by Google and CEB indicates that people who are emotionally connected to a brand or in this case, an institution, are twice as likely to purchase a product or service, and are four times as likely to be able to fully articulate - and defend - their purchase or enrolment decisions. With fees increasing year on year and more options available for students, prospects are unlikely to apply to an institution without doing some thorough research first. So what can universities do to ‘click’ with prospective students? In a highly competitive online world, universities are investing much more time and money into their marketing strategy by diversifying their efforts. If they don’t, they run the risk disappearing from cyberspace, leaving room online for their competitors to take hold. According to the Associated Press, 27,000 courses were listed online this August, and with applications down by 4% in the UK, competition was even more fierce as many universities struggled to fill all of their places. Increased access to new technologies means that the time we spend online has doubled over the past ten years, with the average 16-24 year old spending 27 hours a week on their phones, tablets and other devices. Therefore, it’s important for universities to make sure they are consistent and clever with their online marketing efforts. The internet is awash with content, so many institutions are finding innovative ways to create meaningful and engaging messages. The way universities are allocating their budget when it comes to recruitment strategy has changed. Of the 69 UK university marketing teams polled, 57% said open days were more important than five years ago, together with external digital advertising (72%) and social media advertising (98%), according to a survey by The Guardian. So what’s needed is a well-rounded approach to attract and retain new students. 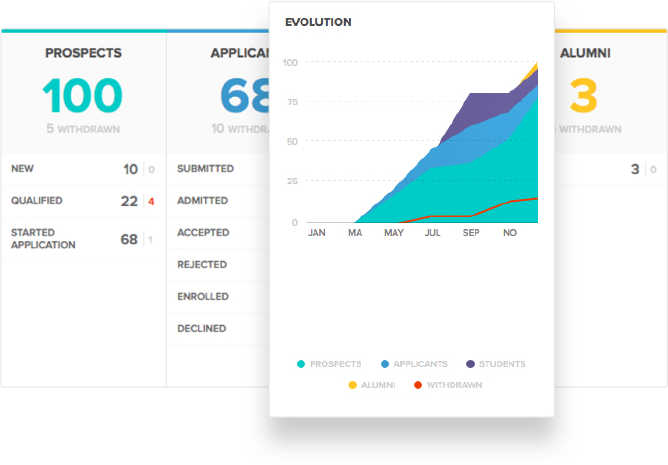 The following components - if implemented well - can help universities drive more results in their recruitment and admissions efforts. 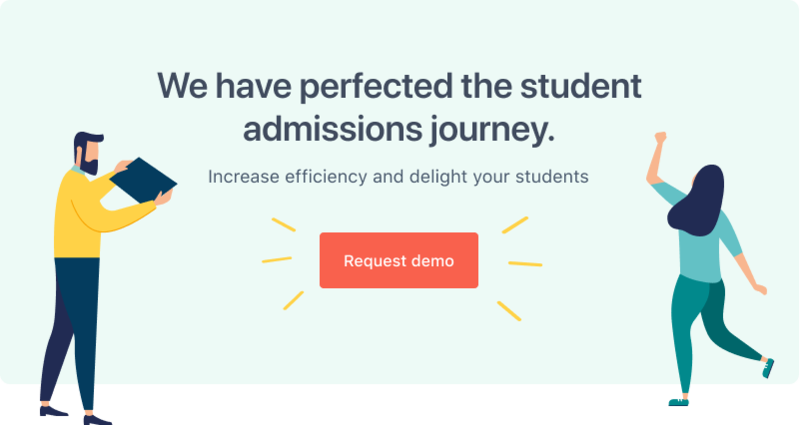 For universities who want to make the recruitment and admissions process simple and transparent for both students and staff, a modern customer relationship management (CRM) platform is vital. It should be the backbone of an institution's marketing operations. Not only does it streamline communications and cut down on the team’s workload, it enables them to target different prospects with different messages based on their demographics, interests and behavioural data. Many institutions depend on legacy CRM systems that rely heavily on manual work, leaving staff drowning in unnecessary bureaucracy and wading through numerous spreadsheets! Marta Andaluz, Marketing & Admissions Coordinator for the Lisbon MBA, has first-hand experience of the difference a good IT system can make to the university recruitment process. As one of the most popular postgraduate courses in the world, the MBA market is notoriously competitive and The Lisbon MBA wanted to build a personal relationship with prospects as soon as they came into contact with their brand. The Lisbon MBA decided to adopt FULL FABRIC as the platform for their recruitment and admissions strategy. In doing so, they are now able to aggregate a prospect’s information to personalise marketing messages according to what stage of the process the applicant is at. After using the CRM for a full-cycle, Lisbon’s class size grew by 18%, despite the fact that worldwide MBA applications declined. “FULL FABRIC gives us a 360-degree view of the pipeline. I can instantly see where people are in their decision-making process and customise my communications accordingly; this has greatly increased our productivity in the marketing and admissions department,” explains Marta. The programme also markets its academic, social and career calendars on the website to promote a well-rounded approach to learning. Their magazine, The Lisbon MBA Review, contains success stories and stoplights focusing on startups and entrepreneurship, international development and student wellbeing. In order to attract the attention of generation z and millennials, for whom technology been an intrinsic part of their day-to-day life since early childhood, higher education institutions are getting creative with their campaigns and are turning to video and social media to reach as wide an audience as possible. One such institution is the University of Sheffield. Following the Brexit referendum of June 2016, staff at the university worried that applications from international students would dip. The higher education sector is one of the largest employers of international staff and the city is home to thousands of European students. To let the world know that the university remains committed to diversity and inclusivity, they relaunched their #WeAreInternational campaign. “We were getting enquiries from foreign students feeling that the UK was shutting down and wasn’t going to be so welcoming, so we thought there was a great need to dispel some of those myths and to ensure the UK continues to be welcoming to international students,” explains Carrie Vernon, Sheffield’s head of marketing. In response, they curated a collection of videos and images focusing on the stories of international students living and studying in the UK, and shared them on the #WeAreInternational website. The inspirational campaign continues to serve as a successful recruitment tool, whilst offering a more lasting resource that reaches beyond the campus boundaries. Student voice is a big part of the university’s marketing strategy. Clearing is another great time for UK universities to market their courses to those who are yet to secure a place. It’s their last opportunity to increase the intake for the academic year and fill any empty seats going to waste. Using the Tinder app as a source of inspiration, the University of Salford launched its own version to recruit during clearing: Match Made in Salford. Instead of searching through lists of available courses online, students can use the app to find a last-minute course quickly. Using data such as the individual’s grades, initial course choice and career aspirations, the app displays the most relevant options, (hopefully) finding them the perfect fit. According to Salford’s marketing director, 10,000 candidates managed to find a match on results day through the app. #MatchMadeInSalford is still used by students, staff and alumni on the university’s Twitter page to generate hype around the institution and its activities. To improve a marketing strategy in time for the next round of applications, it’s important for institutions to take stock of how successful campaigns have been in terms of engagement, and to figure out exactly who is reading and watching what. For instance, using analytics to find out the demographics of visitors to a specific web page enables marketers to find and fill gaps in intake and target a wider audience. It helps professionals to improve content and design by evaluating which call to actions were most successful in specific marketing campaigns, and which subject lines proved most popular. From an ROI perspective, universities can use analytics to track marketing activities (including events) to better understand which initiatives had the most impact in the recruitment and admissions process. A CRM like FULL FABRIC provides detailed insights into marketing activities, making it easy to track campaign reach and overall ROI. If you’re a higher education institution with a successful marketing strategy, we’d love to hear from you! Share your tips and story with us on twitter @fullfabric, using the hashtag #HigherEdtech.